We frequently have customers that like to take one of our styles and make it their own. It's something that we encourage. As I was going through the inspection area the other day this pair of chairs caught my eye. The first thing that popped into my head was that it was a terrific idea to use small wing chairs at the end of a table with complementary, but stylistically different side chairs. As I pulled them aside to get a better look I noticed that neither chair is a standard style that we make. The side chairs are based upon the Rolled Back Dining Chair with Half Skirt. However there are a lot of small changes that really make it a totally new chair. First of all it has a camel back instead of the rolled style. It also keeps the short skirt, revealing the finished legs but the skirt is a box-pleat as an alternative to the kick-pleat skirt. 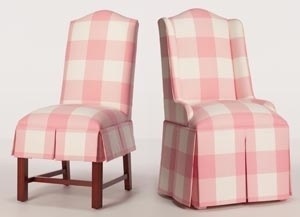 Finally, the tapered legs of the original style have been replaced with Chippendale type. The end chairs get a similar treatment. Once again the customer started with a Danbury Parsons Wing Chair, but requested some alterations. The Crescent back of the Danbury was substituted for a camel back and the kick-pleat skirt was replaced with a box-pleat for a perfect match of the side chairs. While there is no way for us to allow this level of customization on our web site, we encourage you to call us with any changes you'd like to make. In most cases we can accommodate the request. Call one of our design consultants (828.396.1049) for more information or to get a quote.